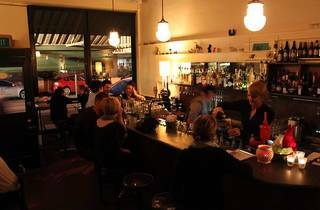 There’s a hidden gem in the upper reaches of Lygon Street, and its name is the Alderman. With its narrow, dark-painted shopfront and minimal signage it’s easily missed by passers-by, and even repeat visitors have been known to wander past it. Once found, however, it turns on the charm fast. The front room, home to the distinctively bowed bar, is scattered with sweetly kitschy trinkets such as sporting trophies and ceramic wildlife statuettes. Entering the back room feels oddly like being transported into somebody’s house - perhaps it’s the old-fashioned fireplace complete with leather bellows, or the board game collection, or the creaky-looking staircase leading up to the associated art gallery, Death Be Kind. Pushing on into the backyard, the impression that you’re in a private home deepens - even the presence of a prefab-style toilet block does little to detract from it. The long, narrow courtyard, threaded with strings of coloured lights, is the Alderman’s best-loved feature and attracts more drinkers than the interior of the bar even on foul nights. 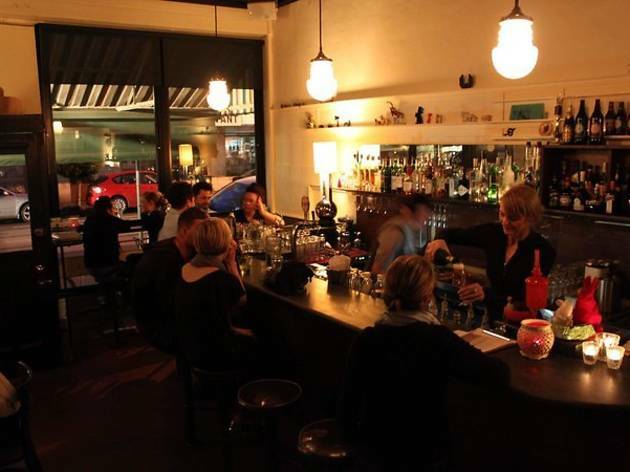 It’s where the smokers gravitate, naturally, and dog lovers and their pets are welcome back there.